AHD Subtitles Maker is a powerful tool designed to work with Windows®. It permits you to create the most common text-based subtitle formats in minutes. AHD Subtitles Maker is an application that creates subtitles automatically without the need of scripts. Also you can edit subtitles with it using the mouse ! no need to enter numbers, just move the subtitles, stretch them, synchronize them and more….. only with the mouse. The list of editing functions is impressive. You can translate, insert, change, or copy the text of a selected subtitle, and you can move it from one time position to a different one with millisecond precision. You can also empty a subtitle stream from all its texts and replace them with different ones, but preserving original time positions. It includes an auto encoding detecting feature which help user to choose the right encoding for importing and exporting, also it support all the encodings that your installed Windows® version may support. AHD Subtitles Maker Supports the most common text-based subtitle formats that can be exported as a single file (but not inside the media file) and can be used in most media players and creation programs. It supports common subtitle formats like Power Divx / DVD Subtitles and more. Also it supports the media files types that your Windows® can support, because it depends on the Windows® media player and its media codec pack that is installed in your system. The beauty of this extensive list of formats is that it is classified by tool, not simply by the extension of the file, as this is usually shared by different programs. For example, you can produce many TXT files, but each will be customized according to the tool you want to use (Cavena, DVD Junior, DVD Subtitle System, Adobe Encore DVD, etc.). AHD Subtitles Maker can get and save the ID3 tags (Synchronized Lyric). you can extract Synchronized Lyric to your project as subtitles track, work with it, and export it to another format as well. Also you can add a subtitles track as an ID3 tags (Synchronized Lyric) item and SAVE IT DIRECTLY INTO MP3 MEDIA FILE. Create the most common text-based subtitle formats in minutes without writing scripts !!. Edit subtitles using the mouse !! 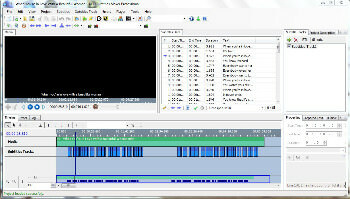 don’t enter numbers if you want and edit subtitle timings using the TimeLine control. Get access to mp3’s ID3 Tag (Synchronized Lyrics) frames and manage them, load them to your project and save them to the same mp3 file. OpenSubtitles.org integration, ability to search, download and upload subtitles from/to OpenSubtitles.org. Translate subtitles using Google Translate® service. Convert subtitle formats and any text file encoding easily using AHD Encoding Converter tool. Use your system’s media codecs to be playable for any media kind (Audio and Video) available. Can Rip subtitles from Matroska (.mkv) files. Added: Ability to change media player in settings. Added: Play media using VLC media player. Fixed: changing media while generating wavform crashes ASM. Removed: check for update feature temporary in this version.